This book presents, for the first time, a detailed transcription of Jacob Viner's Economics 301 class as taught in 1930. These lecture notes provide insight into the legacy of Jacob Viner, whose seminal contributions to fields such as international economics and the history of economics are well known, but whose impact in sparking the revival of Marshallian microeconomics in the United States via his classroom teaching has been less appreciated. 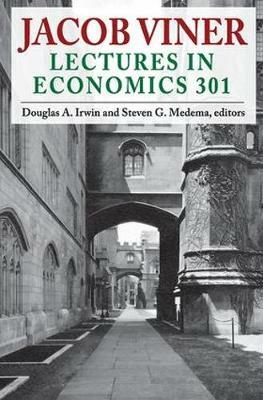 Generations of graduate students at the University of Chicago have taken Economics 301. The course has been taught by such luminaries as Milton Friedman and Gary Becker, and remains an introduction to the analytical tools of microeconomics and the distinctive Chicago way of thinking about the market system. This demanding and rigorous course first became famous in the 1930s when it was taught by Jacob Viner. When read in tandem with the Transaction editions of Milton Friedman's Price Theory, Frank Knight's The Economic Organization, and Gary Becker's Economic Theory, Viner's lectures provide the reader with important insights into the formative period of Chicago price theory. These recently discovered notes from Viner's class will be important for historians of economic thought and anyone interested in the origins of the Chicago School of Economics. "A valuable contribution to the understanding of how some of the main features of Chicago Economics took shape. They offer a remarkable and high-quality testimony on how microeconomics was taught in the early 1930s by one of the most distinguished (and eclectic) neoclassical economists of the interwar period."